The Healy Three Bears is a full size grocery store with a warehouse flare. Find everything you need: groceries, fresh meat department, fresh produce, organics, deli, health and beauty aids, pet needs, and seasonal items. You can also pick up bulk buys and office and school supplies. No membership is required at Three Bears. We are now offering FREE delivery to businesses! That’s right, we are offering free business delivery to Healy, Cantwell, Denali, Anderson and everything in between. Contact our special orders department to find out more information about this service from Three Bears Alaska. Attached to the location is an Ace Hardware, with everything you need for those home improvements or just sprucing up your cabin. Sunday – Wednesday: 11:00 a.m. – 7:30 p.m.
Thursday – Friday: 11:00 a.m. – 7:30 p.m.
Click to see what our Outpost Sporting Goods section has to offer. We sell hunting & fishing licenses. Monday – Saturday: 9:00 a.m – 9:00 p.m. The Bears’s Den Liquor Store is fully stocked to include a Growler Bar. Pick a 32 or 64 oz size growler and fill it up with one of our many featured local brews. Buy the beer and growler on the same purchase and receive 10% off the price of the growler! Save big with our everyday low prices on liquor, beer, and wine selection. Monday – Saturday: 7:00 a.m – 9:00 p.m. There is a huge selection of drinks, snacks, and a 132 Flavor Coca-Cola Combination Soda fountain machine, snacks, tobacco and auto items (oil, wiper fluid, etc.). There is also Hot Stuff food to-go. Hot Stuff Pizzas To Go! 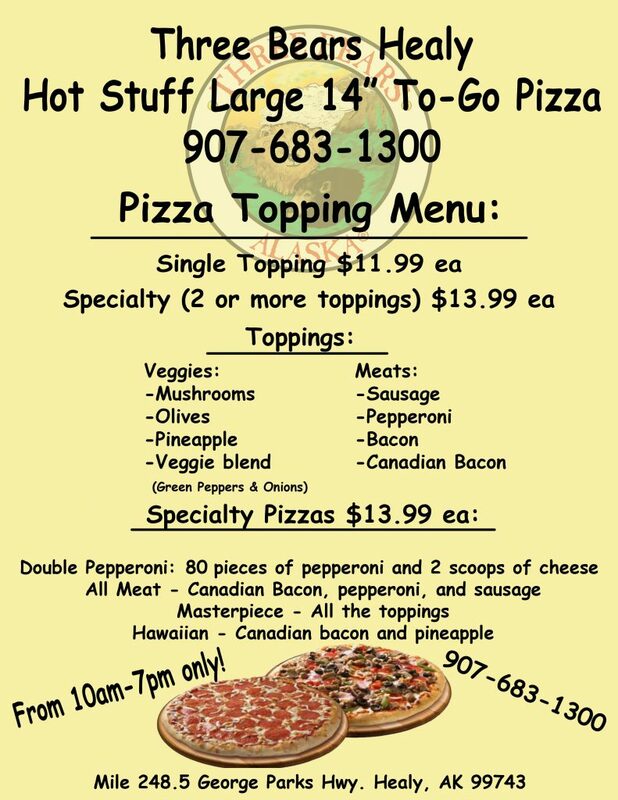 We offer large 14 inch, made to order, hot, and ready to eat Hot Stuff pizzas to go! $11.99 for a single topping and $13.99 for a specialty (two toppings or more). Call ahead 907-683-1300 and place your order so there is no waiting. Choose from great specialties like the all meat, the supreme, Hawaiian, and double pepperoni or pick and choose your own toppings. We sell Shell gas, diesel, bulk propane, & even home heating oil. Fuel pumps are open 24/7, for debit or credit sales only. Sign up and save with the Shell Fuel Rewards Program!